The results of the 13th Crystal Cabin Awards have been announced, with the eight category winners presented with their trophies at a function in Hamburg’s Chamber of Commerce, with guests including Sir Tim Clark, president of Emirates, model and actress Toni Garrn, and Hamburg’s governing mayor, Dr Peter Tschentscher. 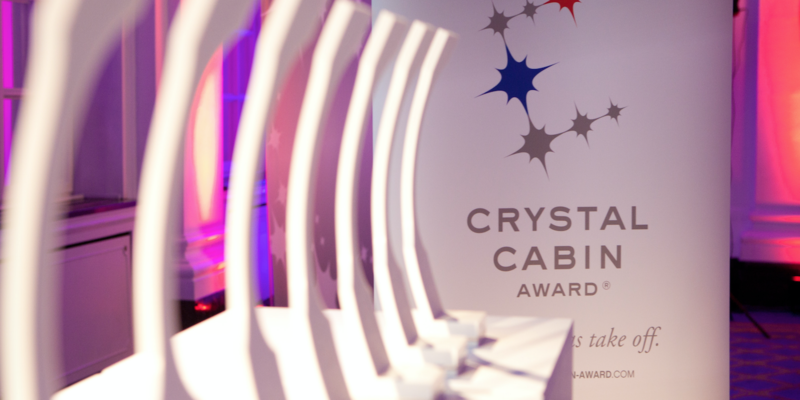 The Crystal Cabin Awards are presentedeach year as part of the leading global trade fair, “Aircraft Interiors Expo”. This has been a record year for the Crystal Cabin Awards, an initiative established by Hamburg Aviation, with more than 100 entries submitted from 22 countries. 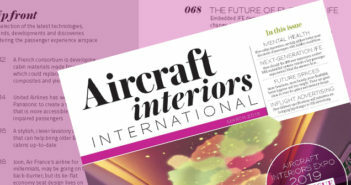 The judging process began in December, when the 27 members of the international expert jury (including Adam Gavine, editor of Aircraft Interiors International) evaluated some 94 shortlisted entries (a few initial entries were rejected). That initial round of voting created 24 finalists in eight categories, with the final round of evaluation resulting in eight winners. 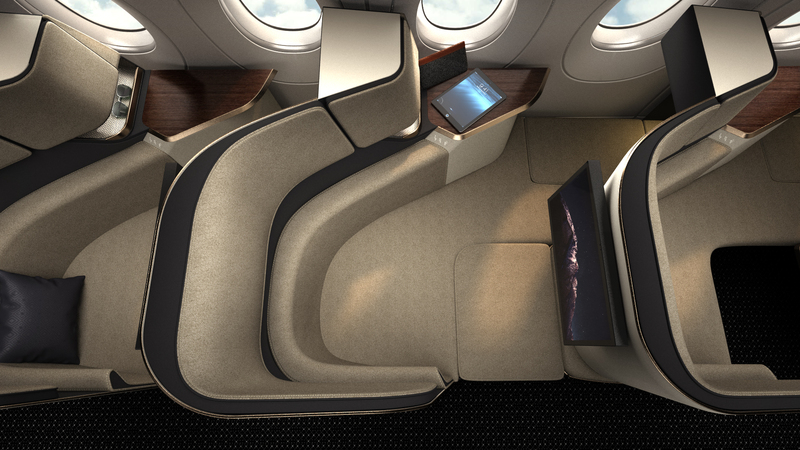 The Cabin Concepts category recognizes excellence in aircraft cabin design. This category usually receives the most mainstream public interest, and with three huge names in aviation vying for the prize this year – Airbus, Emirates and Safran – 2019 is no exception. 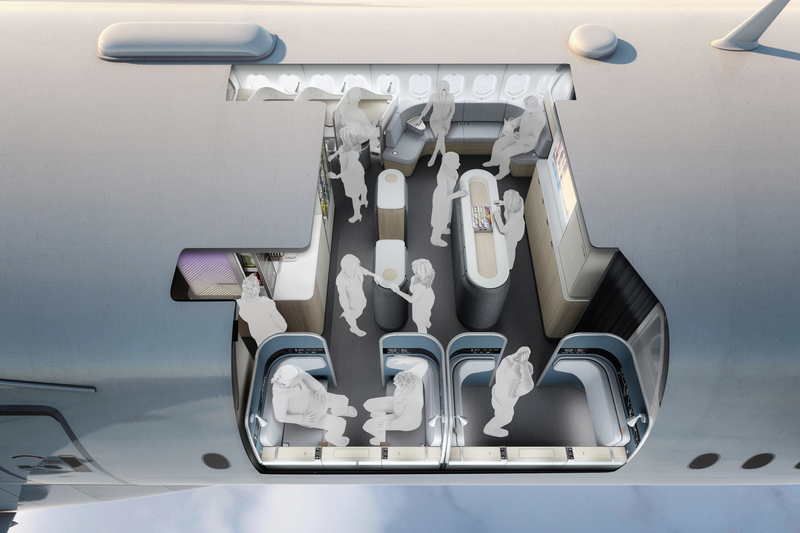 This year saw Airbus win the prize with its ‘Lower Deck Pax Experience’ modules, a concept that proposes that the cargo containers stored underneath the passenger cabin can be swapped with other modules with the same size and loading system, fitted out with comforts such as lounge areas, play areas or quiet zones for economy class passengers. The modules are being co-developed with Safran Cabin and could be available to airlines in 2020 for the A330, with potential availability for the A350 later on. MORE DETAILS HERE. Emirates impressed with its new Boeing 777-300ER first class suites. The already luxurious cabins have been fitted with fully enclosed suites to take the experience to the next level: the atmosphere of a private jet. The six private suites are in a 1-1-1 configuration, replacing the arrangement of eight suites in a 1-2-1 layout. But what of the poor souls in the center suites without windows? 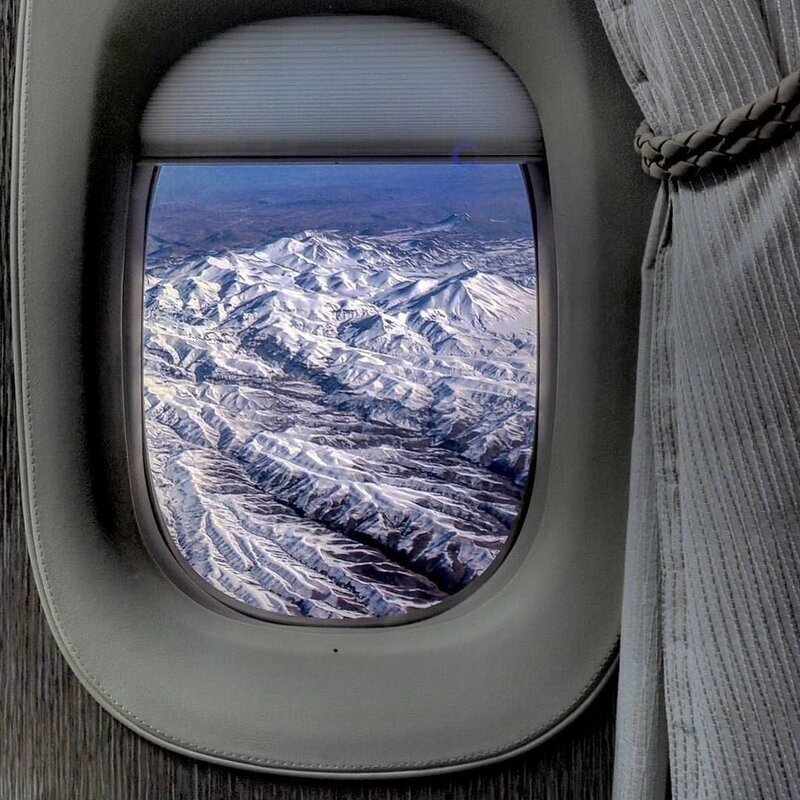 Emirates has thought of them, fitting ‘virtual windows’ – displays showing a feed to the outside, meaning that every suite has a window view. These ‘windows’ also made it to the finals of the IFEC category (see below). MORE DETAILS HERE. Safran’s Essential business class seat design focuses on reducing weight rather than adding opulence. By replacing the typical heavy mechanical components of a seat with innovative cushion structures, Safran claims to have achieved a 25% reduction in weight. The design also yields a claimed increase in living space of almost 20% – space previously occupied by kinematic systems and a bed space that is a claimed 15% larger than that of comparable angled seats. A seat design would not usually be in this category, but the simplified design of Essential also enabled a sizeable increase in under-seat stowage space, sufficient to accommodate roll-on bags. With no bags required to be stowed overhead, overhead stowage bins would not be required in the cabin, creating a more open and spacious feel. You can view a video roundup of the category finalists HERE. This category recognizes innovative ideas for enhancing passenger comfort, whether for all passengers or for specific groups of passengers. This category includes anything from seats, lavatories and bins, to partitions, lighting systems, linings and VIP products. Aircraft seating manufacturer, Recaro won with a long-haul seat that makes economy class travel more comfortable. The key to the winning design is a combination of three comfort elements that enable better body posture, ease of changing sleeping positions, and a reduction of pressure points. 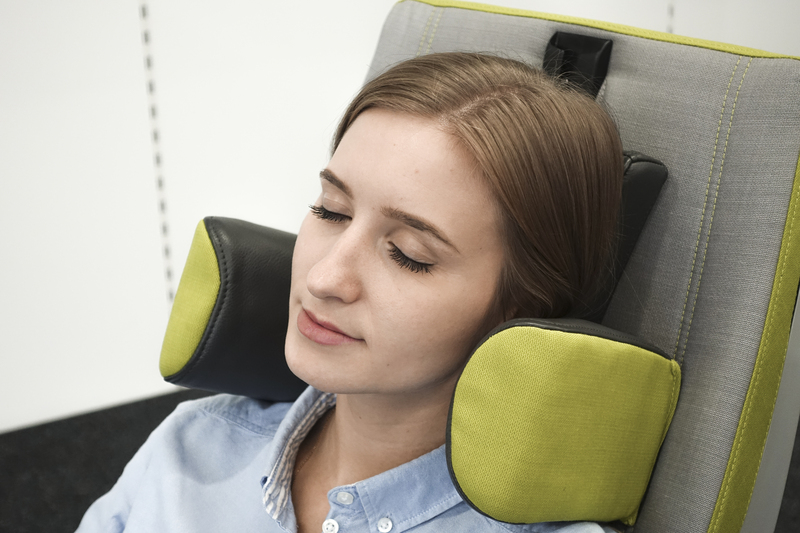 The first feature is the Abrazo headrest, which gives additional side support to the head, while the upper legs and parts of the lower legs can be supported by the Extended Seat Bottom option, which increases the size of the seating surface and reduces pressure points, while the Flip Cushion helps to support the lower lumbar area in a cradle or sleeping position. Panasonic was a strong competitor with its Active Noise Control technology for business class seats – part of the company’s Wellness solution. Built-in active noise control, without the use of headphones, can give business and first-class passengers a more comfortable and restful sleep experience on long-haul flights by reducing background aircraft noise. Calming music or bird noises can even be selected by the passenger, if they find such sounds restful. The third finalist in this category was French design studio, Style & Design, with a radical approach to long-haul seating. 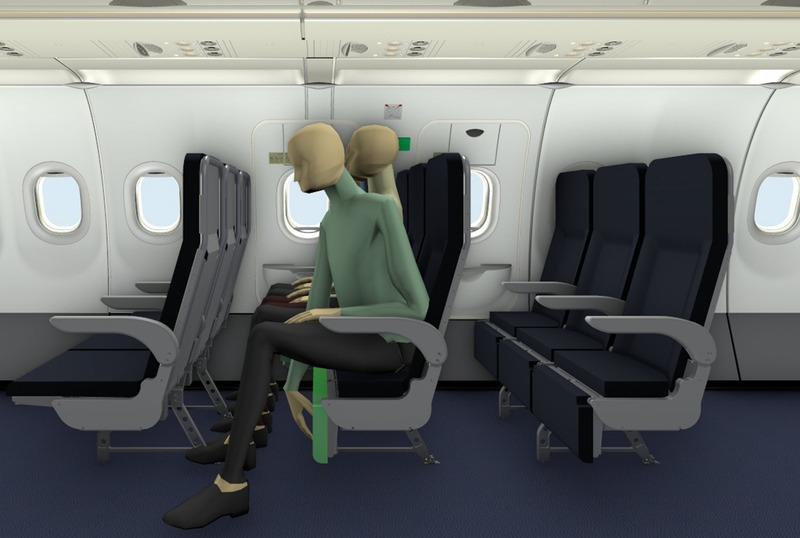 The studio has found that not having the same body parts in contact with the same surfaces on long-haul flights (which can be up to 19 hours) is instrumental to passenger comfort. Thus the Moments concept significantly extends the seating space in business class, offering a range of sofa-like positions for sitting, lying and turning, without requiring extra cabin space. The Cabin Systems category looks for efficient designs, covering everything from galleys, lavatories, trolleys, air conditioning, electrical systems, electronic cabin management systems, waste & potable water systems and acoustics. Judging criteria included factors such as the efficiency of mechanical solutions, ergonomic advantages and ease of implementation. Collins Aerospace won the prize with its M-Flex Duet kiosk that exploits unused space for passenger service. Many premium self-serve areas require seats to be removed to accommodate the differentiated service monuments, and that loss of seats can cost airlines six figures in lost revenue every year. However, the M-Flex Duet monument can be fitted without any loss of seat count. During taxi, take-off and landing the monuments are stowed and their compact design helps ensure they meet all regulatory aircraft egress requirements. 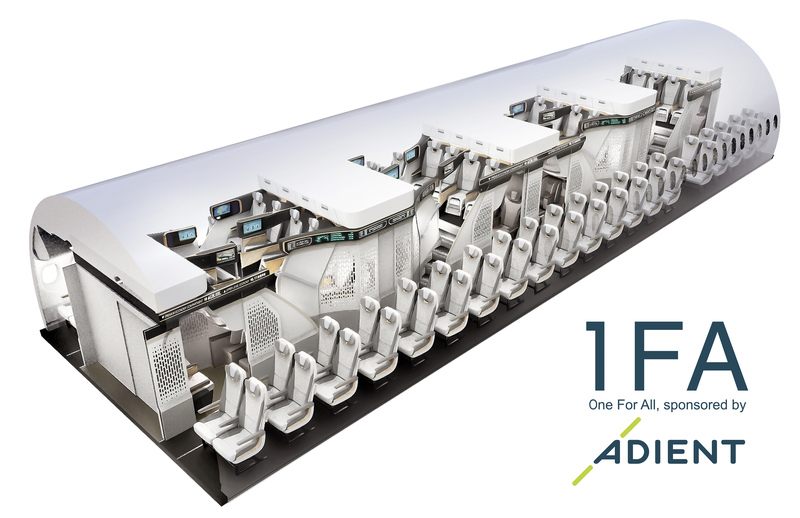 Once the plane is cruising, crew can unfold the units (similar to opening a closet door), stretching them across the doorway to create a stand-up branded self-serve social area, an additional crew working space or even a retail area to help generate ancillary revenue. Airbus also focused on flexibility with its X-Tend Seat, a seat designed for over-wing exit rows on narrow-body aircraft. To comply with emergency evacuation requirements of over-wing exit rows, these rows often have a seat pitch of around 38in to create a 13in walkway to the exit. Compared with the typical seat pitch of 28in in the rest of the cabin, these rows are great for passengers, but bad for revenues, taking valuable space. However, the X-Tend Seat features a seat pan and bottom cushion that can be partially folded down when the passenger stands up, which enables the required width to be created within a 33in pitch, freeing up space that the airline can use to squeeze in another row of seats, or to add a little more space to each seat row. The third contender in the Cabin Systems category was Diehl Aviation’s FlexPSU, a flexible passenger service unit (PSU) system. It can be difficult to move current PSUs to suit changing cabin configurations, mainly due to their wiring and their features such as air vents and reading lamps. The solution provided by FlexPSU is to implement a rail system integrated into the overhead bins, with each PSU requiring just three connections to operate. The simplicity of the mountings and connections means that the FlexPSUs can be relocated in just a few simple steps within minutes. The reduction in cabling also creates a weight saving. If you like FlexPSU, you will be interested in Diehl’s Diana cabin concept. See HERE for details. This category combines different classes of innovations, all with an environmental focus. Entries in this category must either reduce the negative effects of aviation on the environment, or minimize health or safety hazards and security problems for passengers, staff or live cargo. European and international legislation compliance is taken into consideration for the evaluation of each entry. The Skycouch from Air New Zealand has proved very popular since its launch, and indeed the original seat won the Passenger Comfort category of the 2011 Crystal Cabin Awards, breaking new ground in creating a genuine luxury upgrade for economy class passengers, with a row of seats able to be converted into a bed on demand (for an additional fee, if space permitted). Eight years later the revised Skycouch has won again! The latest development is that Skycouch is available as a family space, with new belts and features ensuring that even babies and infants can be safely put to bed in the space. MORE DETAILS HERE. Panasonic Avionics impressed with its Nanoe air filtration system, a module which forms part of Panasonic’s Wellness initiative, and which can be integrated into the seat structure of a first or business class seat. 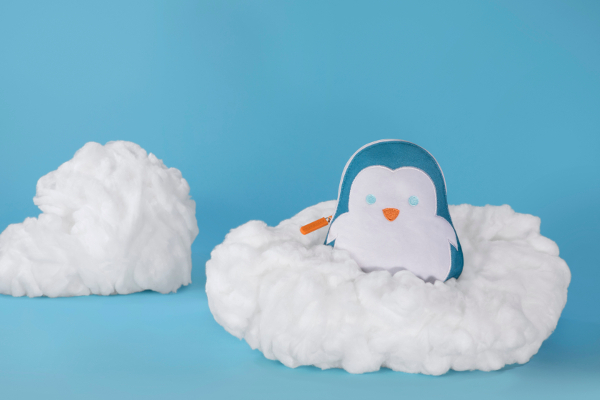 The module suppresses airborne and surface viruses, bacteria, mold, pollutants and allergens within its local environment to eliminate odors and improve air quality for the passenger. 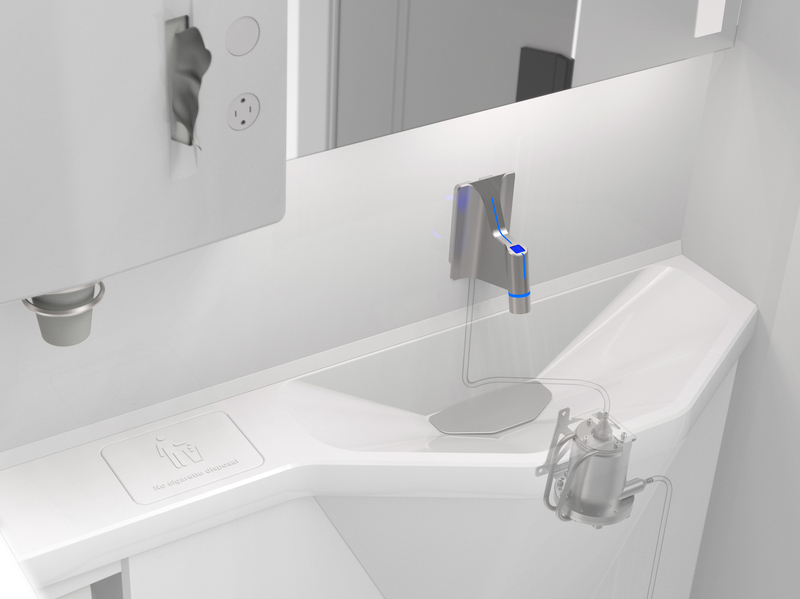 Diehl Aviation presented strong competition with the UV-LED Water Disinfection Unit, a retrofit antibacterial filter for the lavatory that means that the tap water is safe to ingest, whether a passenger wishes to drink or perhaps use it while brushing their teeth. The unit is based on UVC LEDs – a compact, robust technology with low power consumption, which can be integrated close to or indeed directly into the faucet. The unit operates at a wavelength optimized for the efficient elimination of germs, with Diehl claiming that it kills at least 99.99% of germs. This category covers the fastest growing, fastest developing sector of the aviation industry and includes areas such as accessible content, antennas, passenger apps, moving maps, unique cabin wi-fi features, etc. 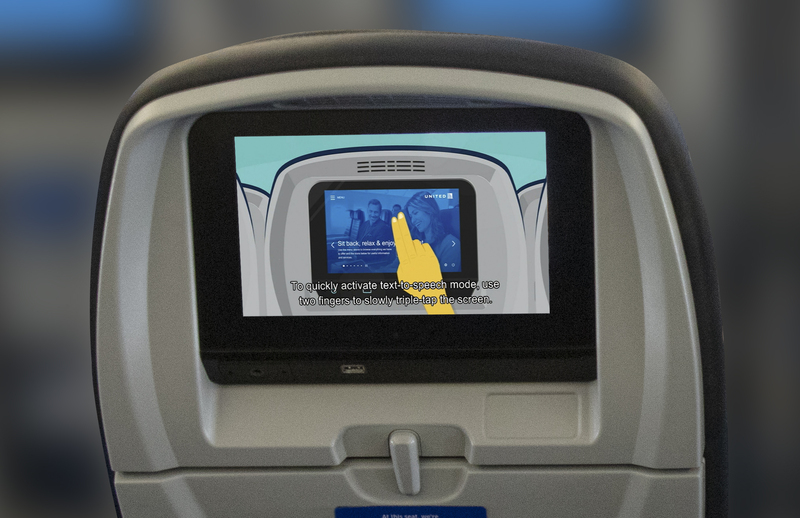 United Airlines is a worthy winner, having introduced the world’s most extensive suite of IFE accessibility features, providing entertainment for passengers with any level of visual acuity, as well as hearing and mobility-challenged people. Features of the system, aptly named Entertainment For All, include text-to-speech with reading granularity options; customizable voice volume, voice speed and voice pitch; ‘explore by touch’ features; screen magnification; customizable text size; high contrast text options; color correction options and a color inversion option. Hearing impaired and non-English speaking passengers can also enjoy content served based on individual requirements and custom messaging tailored to the individual. One entry impressed not just the judging panel but also Emirates airline. 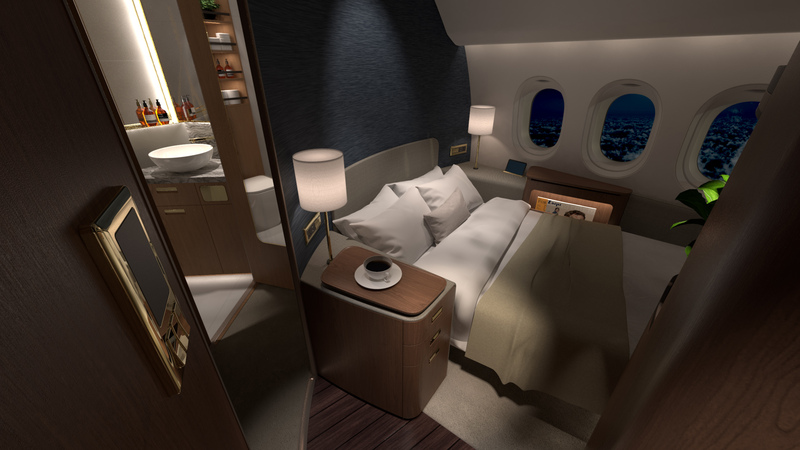 The virtual windows from Collins Aerospace are used in the airline’s first class suites, a design that made the final three in the Cabin Concepts category (above). 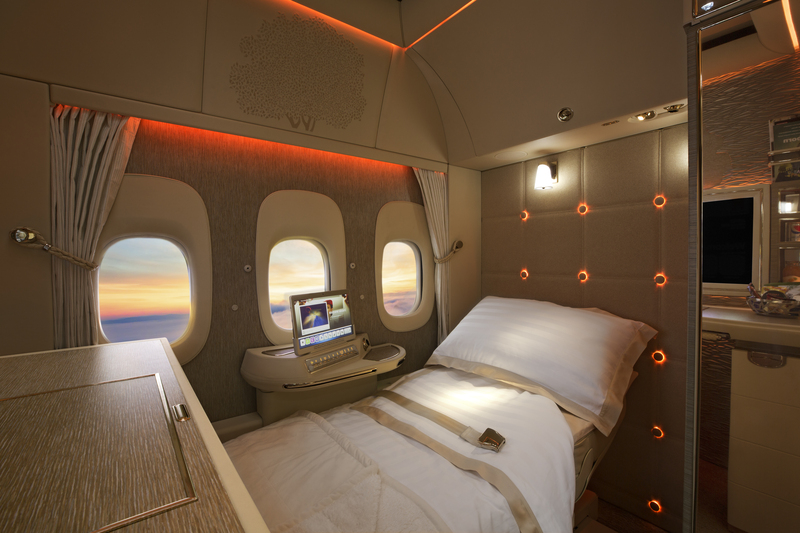 An industry first, displays are used to provide the feel of sidewall windows to inboard passengers – in this case those in the middle suites of Emirates’ B777-300ER first-class cabins, which are configured 1-1-1. The sideward-facing orientation and wide field of view of a row of virtual windows presented challenges including accurately presenting aircraft pitch and roll to avoid motion sickness in passengers, while the wide field of view could create fisheye or barrel distortion effects. However, Collins Aerospace developed a system with a combination of unique custom optics and electronics that has overcome these challenges. Indeed the company claims that the system provides a visual experience superior to that of human eyes looking through conventional windows. Global Eagle Entertainment (GEE) was an exciting competitor with what it describes as a “major milestone in the history of satellite connectivity”. The company has successfully completed testing to demonstrate how a new, low-cost satellite network can revolutionize the way airline and maritime passengers enjoy high-speed connectivity and content. The testing began October 18th, 2018 near Telesat’s headquarters in Ottawa, Canada. The test, carried out using GEE’s ‘Albatross One’ test aircraft, marked the first time an in-flight aircraft has communicated at broadband speeds with a low-earth orbit (LEO) satellite system, demonstrating the capabilities of LEO for mobility customers, even in regions currently subject to poor connectivity, such as polar regions. The team reports “industry leading” data upload speeds from the aircraft, based on testers engaged in uninterrupted video chatting and movie streaming, and experiencing what they say is the lowest latency of any satellite connection to date. Developing new materials, new material applications or a new combination of materials for cabin systems can cut production costs and maximize usability. This category rewards such innovation and embraces an enormous variety of different aircraft components. Entries can be an innovative, single technical component or material, but not a fully developed product such as a seat. Collins Aerospace was the shining star in this category with the μLED reading light, which replaces existing cabin reading lamps with a dense array of LEDs that work as a variable geometry light source that is then projected to create any shape of form, limited only by the resolution of the LED density. The μLED design is essentially a miniature projector, but without the cost and size associated with an LCD or DLP light engine, and as well as a reading light, can be used as accent or suite lighting, for example. The software in this technology can create reading light spots of various sizes and shapes, and eliminate the need for different part numbers. μLED can also offer keystone and flux correction and even convert into a wide angle dome light. The unit can also create multiple, discrete spots from one LRU (two or three seats from one part). According to Collins, additional functionality in future software updates could enable features such as airline logos, seat numbers, passenger guidance and animated effects. The Kydex Lumina opaque thermoplastic sheet from Sekisui SPI also has a focus on pleasant lighting. The customizable sheet has been created to enable aviation interior designers to shape the passenger environment in new ways, giving designers the ability to craft bespoke experiences using color, image and light. As well as filtering light, as light passes through Lumina selectively, silhouettes can be shaped by internal patterning, color saturation and imagery. In concert with LED systems, Lumina can be used to shape and refract stark light, creating soft textures, comforting tones, and a more refined environment. The third finalist was Safran’s Flexible Door, created in response to the growing trend for enclosed seats in business class. Adding a door to a business class seat has certain issues, including expense, weight, certification and reduced in-seat living space. 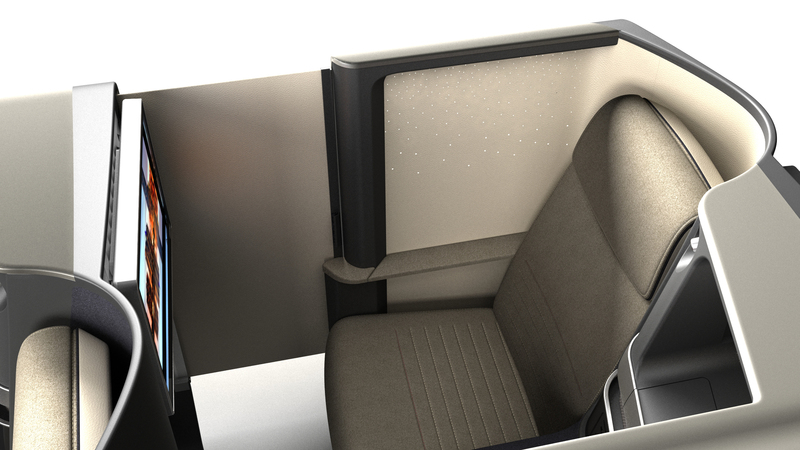 Safran’s solution is a door made from flexible materials that is integrated in the sidewall of the seat and which can be drawn across the aisle access space, almost like a blind, when needed. 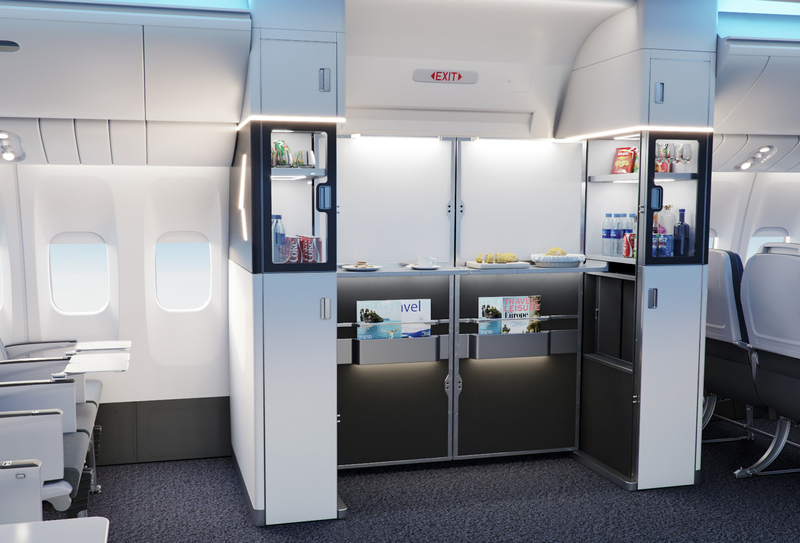 For thoughts about the trend for doors in business class, see John Walton’s feature HERE. This category is a fantastic opportunity for for college and university students to present their visions for innovative aircraft interior products and concepts. Ideas should reflect the idea of making flying more comfortable or ecological. Students in this category may benefit from gaining important contacts within the industry who can help develop their future career. Finalists in this category came from students all over the world. The winner is Sahngseok Lee from Hongik University in South Korea, who has designed the 1 For All concept in collaboration with seating manufacturer, Adient Aerospace. 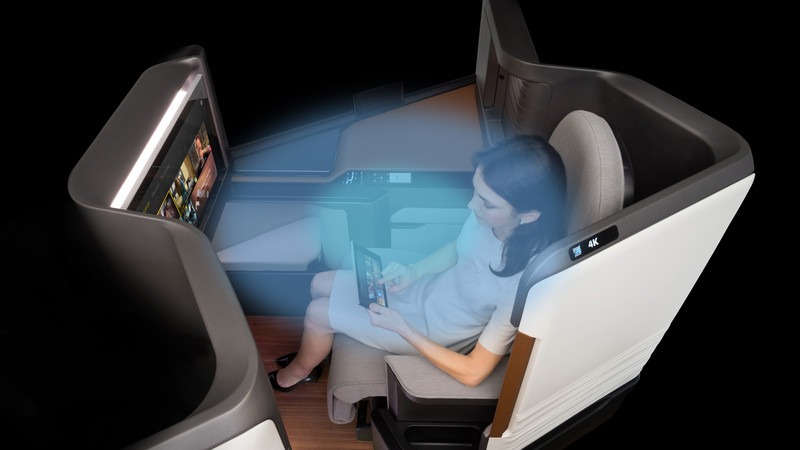 The cabin concept interweaves the various seat classes to achieve the maximum possible use of space. Premium and economy passengers may find themselves next to one another or even above or below one another — alone or within compartments. 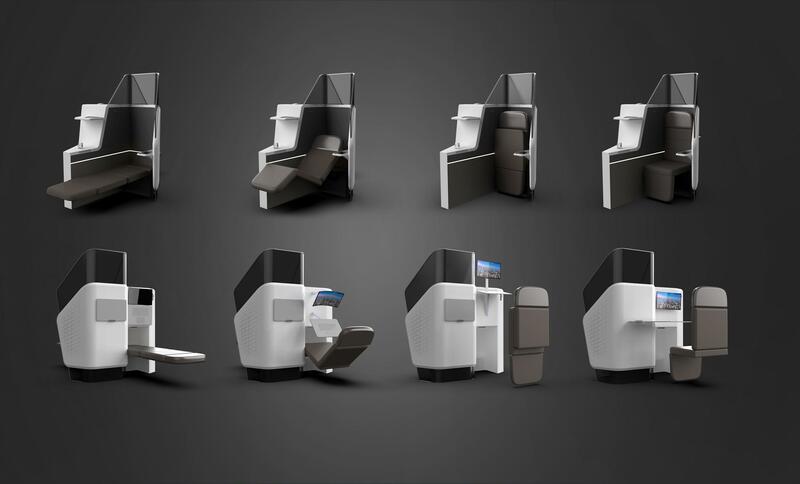 Clément Heinen of Delft University of Technology in the Netherlands impressed with a redesign of business class, created in collaboration with Safran. The Stratus seat design is intended to bring the comforts of the office to the business class cabin, enabling passengers to make the best use of their flight time. The activity-based environment includes a docking station for connecting personal devices and two distinct positions with adaptive table and screen positions: standing and zero gravity. Meanwhile, Joseph Lane from the University of Cincinnati developed an innovative approach to on-board catering. With the SkyDining app, business class passengers can choose meals from their favorite airport restaurants in place of the standard meal options, using a smartphone app. The meal is delivered to the airport at the gate and served hot during the flight in an environmentally friendly cardboard box. The box design is designed to work with another part of the catering concept: a galley cart redesign made up of compartments for meal storage, each with advanced heating and cooling technology. The eighth and final category is Visionary Concepts, an exciting prize which looks to the aircraft cabins of tomorrow. The winner, Paperclip Design, is no stranger to the Crystal Cabin Awards. This Hong Kong-based innovation house won an award in 2014 for the Butterfly convertible seating concept, an award in 2009 for the Paperclip Armrest concept, and was a finalist in 2013 with the Checkerboard convertible seating concept. The latest idea from Paperclip Design is the Peacock Suite, a way for airlines to quickly reconfigure their first class cabins. Flexible partitions and seating arrangements enable individual products to be put together on a flight-by-flight basis as required, ranging from family compartments to three-room luxury suites. Boeing approached visionary cabin redesign from a different perspective. 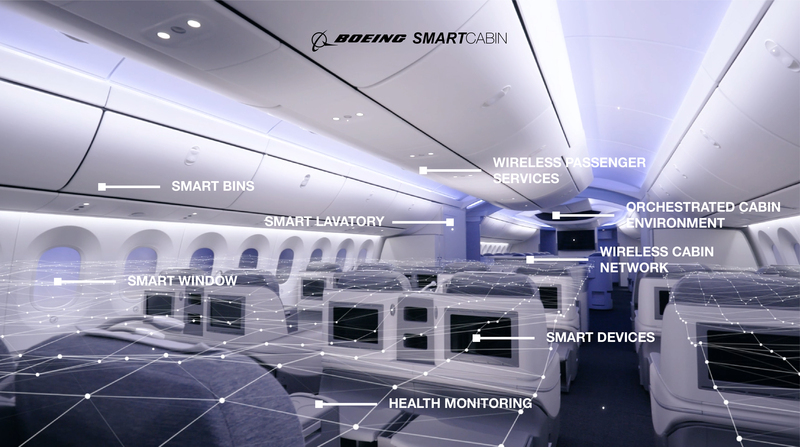 The Smart Cabin concept transforms the aircraft interior into an “Internet of Things” for crew members. Similar to a ‘smart home’ infrastructure, it allows for all components to be digitally managed and controlled with voice commands, from lighting to seating and even lavatories. 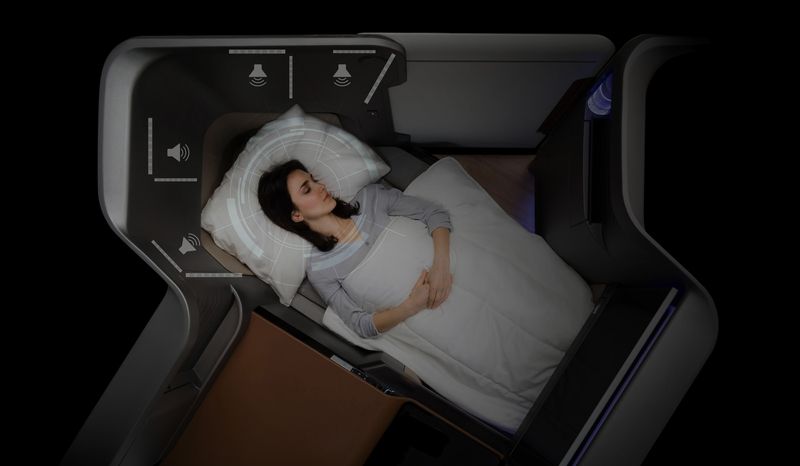 The Smart Cabin is an integrated system and a self-contained ecosystem for the cabin environment, which adaptively responds to the needs and of airline passengers and crew. 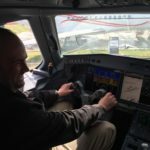 The system can also run analytics to assist crew and airlines with accurate decisions and improve airplane cabin efficiency. 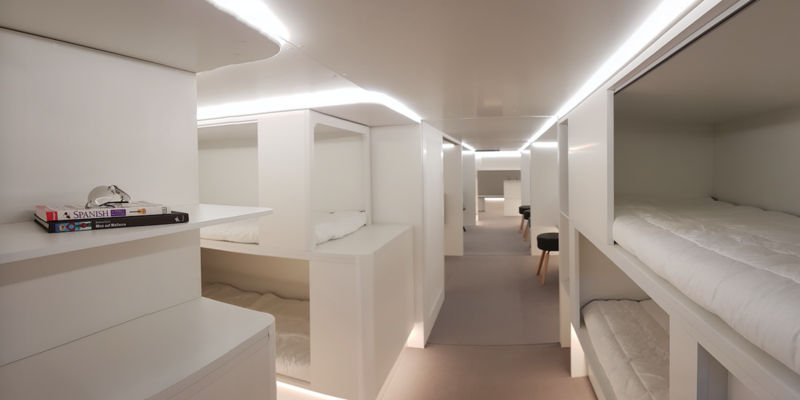 The theme of flexibility is again seen in the Ultraflex Zone visionary lifestyle concept from AIM Altitude, a social zone offering passengers a destination on board ultra-long-haul flights. Wellbeing and stimulation have been considered in the design, with possibilities for the flexible space including secluded booths for meetings, dining, exercise or meditation; a self-service deli galley; communal standing/perching opportunities; low-resistance exercise activities; a pop-up bar and screened sports events. 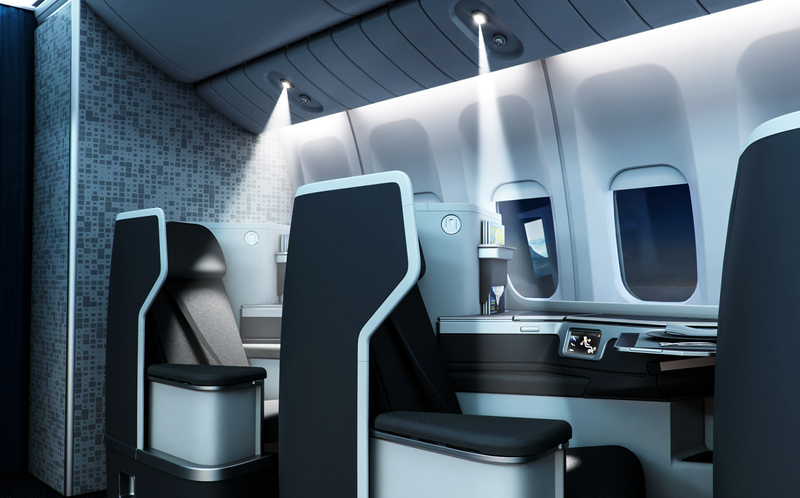 If you have an idea for the future of aircraft interior design and the passenger experience, you can submit it for consideration in the 2020 Crystal Cabin Awards. The awards are a fantastic initiative for recognising and promoting innovative ideas: but beware, the 27-strong members of the international expert jury will be examining all entrants very closely. If you would like to take part, GET IN TOUCH.